An alternative command station: Railuino - Discuss issues with regard to Railuino. Hello all. I'm sure Railuino is very nice project. Let's discuss about Railuino. By the way, I'm developing a software command station using Railuino. Of course, this command station is free software. If you had interest with this try, please tell me your opinions. Do you have any plan for a linux version of the command station ? Currently, I don't have a plan for a Linux version. But I provide source code too. Anyone can update it. On the other hand, WINE(http://www.winehq.org/) may have possibilities to run my command station in a Linux. Also I Checked Desktop Station capability for the Linux mono platform. The result is OK. See an attached picture. Currently, I'm developing shuttle control function like ESU ECOS50200. Would you tell me that this implement is good or not good. This looks like an excellent idea....and already you have made great progress! And with the Arduino platform, the possibilities are endless...like bluetooth communication and perhaps positioning of the trains with ultrasonic! Is this Railuino an digital system? If so...it´s software which you shows up? Hi Yaasan. Could you explain to us how your shuttle control will work please? I have a couple of friends using Arduino in a different role and they are really enthusiastic about it and the support which is available. I took a video which is playing with shuttle control. By the way, "shuttle control" means to control some locomotives, doesn't it? It may be easy to play via Bluetooth. Because Desktop station uses only simple serial communication. "Serial_RS. ino" including inside Desktop station is required to change some lines when you play with bluetooth. Consequently, I seem that connecting with USB is simple and useful. Most users will expect a trains that goes from A to B, stops for a while, continues to C, stops for a while, reverses and goes back to B, stops for a while, goes back to A, stops for a while, reverses and goes back to B and so on. So it seems you only have "train control" (if there is neither automation nor feedback). Yaasan that is a great start. 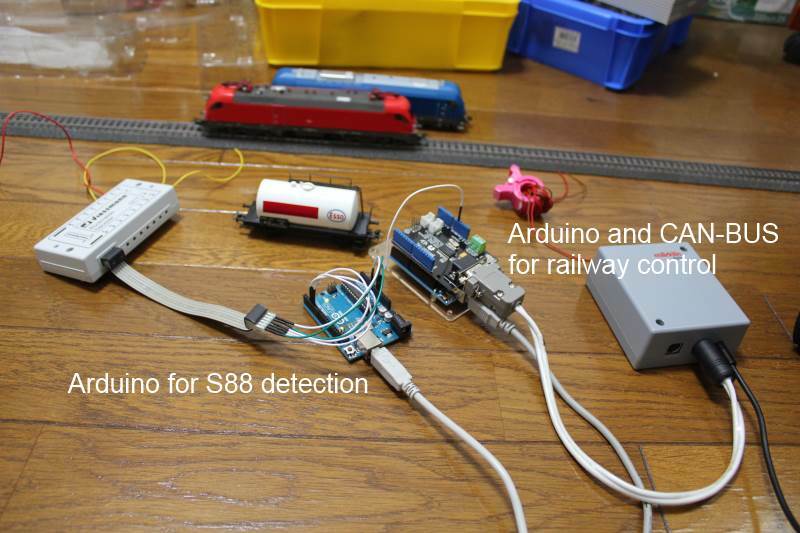 Are you now able to use track sensors to further control the trains? Say addressable sensors which can be allocated to particular functions for a piece of track. And the step after that would be to program a further addressable output which would allow the operation of points or turnouts under the control of certain sensors. Are we going too fast for you? Thanks for explaining and sorry everyone, I had misunderstood "shuttle control" means. But fortunately, I have already developed a similar feature. I have named it teaching and script function. I put an example video. Is this feature similar with "shuttle control"? I explain this feature. Firstly I taught to play locomotive as a script. Finally I run the script. This feature doesn't require any sensors, because I don't have S88 devices. This feature has a weakness which electrical momentary stop confuses locomotive control. I'm developing a function to change accessories graphically. Because I don't have marklin 24624 double slip switch and 3-ways turnout, I'd like to know these turnouts mechanisms. For example, I'd like to know the signal value which is related between an accessory address X and X+1. Address X:RED(0), X+1:RED(0) -> turn Left? Address X:GREEN(1), X+1:GREEN(1)-> turn Right? Do you know if there is any Arduino code in this project to read the Marklin digital signal and turn the Arduino into a K83/K84 type device? Thanks for your reply, Nielsenr, eroncelli. I add an icon of double crossing on desktop station. I will add a function for 3-way switch. The teaching is a cool feature, but the locomotive will drift over time and not start and stop in the same place. The sensors in the track would make sure it stops and starts always in the same places. Railuino has two sensor features. The one is to use S88 decoder(TrackReporterS88), the other is a low cost alternative function (TrackReporterIOX). It is not so difficult to implement a sensor's function for the Desktop Station. Are Playing with sensors (shuttle control) popular with the Marklin users? If this feature is important, I will get S88 decoder and implement the sensor feature. Otherwise, low cost solution is better (but solder needed), I will implement low cost one. Desktop Station has BVE (Japanese free train simulator, http://bvets.net/) key assignment. Because I have a train joystick corresponding to BVE. I got many opinions of S88. Then I'm developing S88 function. I show you prototype image and videos on the latest Desktop Station. Please check below and tell me your request for Desktop Station. The following is a shuttle train demo. As you know, an additional Arduino board is needed. 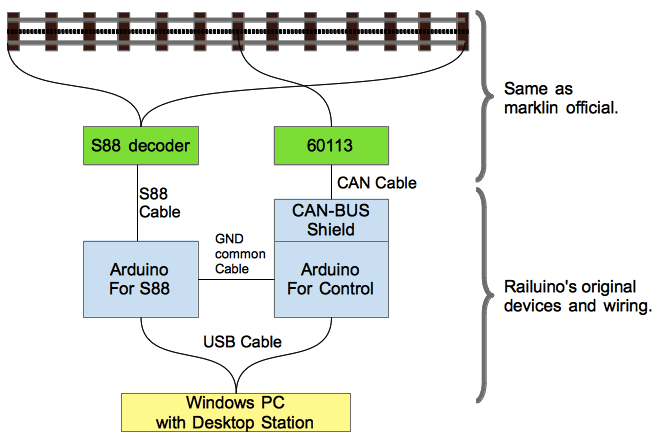 Because Railuino's S88 function occupies CPU power of Arduino's AVR microprocessors. I'm among the few who was thinking to bypass any future need of command station hardware. I read thru your websites. Unfortunately, at the moment, all my trains are in storage. But I'm looking forward to try out your setup the next time I got the chance to run them again. I upload the latest Desktop Station 0.82d. This version supports S88 function. How to setup is written in preparation page. VERY interesting and, most of all, seems to be very fun too!!!!! Was reading a little about Arduino, i think i will give it a try, also it seems very cool to interest the kids on!!! At my work we have built a small layout during the summer for certain testing purposes. We are using the Arduino to control it, but we connect the Arduino with the controlling PC via Ethernet. I haven't been much involved in it but it seems to work well from what I have seen. Ethernet based Arduino control is interesting. USB device server seems similar solution. Typically, USB device server uses as a gateway of printer. In Japan, USB device server price is about $60. We can replace the USB cable to Ethernet including wifi from the command station to the PC. We use Ethernet because then we can plug it into our ordinary LAN and it can be accessed by the different users from their respective workstations at their normal offices. USB is only suitable if you have the PC close to the layout, which is not always the case for us. But for the ordinary user I think USB is just as good. Thank you yaasan, keep up the very good work. very interesting project, with great potential !! Congratulations and keep up the good work !! I have next step which aims to support Ethernet with using Raspberry pi etc. Now I'm considering to change main programming language from C# to node.js for Ethernet support and server style. Ok, all the hardware arrived in the past few days, so today i have finished the assembly, setup the software, and it works nice!!!!!!!! In my analyze, 60113 sends a lot of unknown packets to CAN bus when mfx loco places on the rail. Then Arduino which Railuino wrote would be freezing. However I have a temporary solution. Please try following. (2) Connect 60113 and MS2. Don't connect Arduino. (3) Place the mfx loco on the rail. (4) Run the mfx loco. (5) Stop the mfx loco. Set the mfx loco speed zero. (6) Turn off the 60113 and Remove MS2. (7) Connect Arduino and 60113. (8) Connect Arduino and PC. (9) Turn on the 60113. (10) Run Desktop Station. Let's retry! Hi Yaasan, no luck with mfx locos, but anyway i am having great fun, also exploring more Arduino stuff. there is a great piece of software you have writen so far! I update Desktop Station 0.84b. This version may support mfx locos. Please test it in your environment. I would love to help you more, but my programming abilities are far, far of the ones required for that kind of program. Anyway, i must say it again, great work!!! Hope you can solve all the issues with mfx locos. Some users report me the same problems which don't run smooth and so on. I'd like to analyze this problem. May I know your mfx locomotive ArtNo? Currently I have below list of OK and NG locomotives. Desktop Station 0.85a is added a function which monitors the recognition process of MS2 and adjusts mfx locomotive address automatically . The MS2 recognition process and the recognition process of Desktop Station are different. If you use MS2 and Desktop Station same time or mutually, you have to set same locomotive address. Just stumbled across this thread. This project looks awesome! Will be reading everything through and trying this out in the near future. Of course I will report back! Finally there is a way for PC control without the need of a CS1/CS2/Ecos! Are there any plans on making this MacOS compatible? If so, do you need any help? Just drop me a PM and we can talk. Because Desktop Station is written in Microsoft C# with Windows.Forms, the portability is currently difficult. If you have Windows license, please use Apple's bootcamp or third parties's Parallels Desktop, VMWare fusion. I have followed this post, and are impressed with the work you have done. I intend to give this a try soon. It looks really impressive to me, and now we have an affordable option for PC control. I have an MS2, and the authentic Arduino Uno R3 & the Seed Studio Canbus sheild are available here in NZ at nice prices. I run all my locomotives with ESU decoders & DCC protocol, rather than MM2. Thank you for your efforts on this. I'm sure it will be popular. Yaasan's Desktop Station/Railuino & Marklin MS2, DB Era III/IV Diesel & Steam, ESU Loksound/Lokpilot & Lokprogrammer, Marklin mSD, Tam Valley Depot Octopus III Servo Controller. I found a topic in the another forum. I seem Desktop Station has a problem which form size is strange. This problem seems to be caused by font settings. Probably I have improved this problem in the latest version 0.85b. Could someone try this version? Hello Yaasan, yes, there were an issue before with the form size, thought it was something with my monitor settings, but now is fixed. Also tried automatic registering process with 39017 and 37960, working fine so far. Just ordered the control box for MS2. Also a Arduino and Network Shield is on it's way. Hopefully I will have everything by the end of the week. I do not like waiting for fun things like these.. I am going to commence building of the canbus cable/rj-45 tonight or tomorrow. I have not been able to source a 10 pole mini-din however so I will sacrifice a cable from an old MS1 and use a multimeter to indentify pins and map them to the leads in the cable. Just finished building the cable and everything. I am running into a problem though. Please see the attached image. I get an error when trying to compile/upload the Serial_RS4 file. Any ideas? Did you remember to copy the railuino library to the Arduino directory? Or perhaps renaming it since when you unzip it, the name is src. The zipped file structure is Railuino/src/files. Thank you for the tip Fransisco! I had forgotten to rename the folder. I was certain I did but apparently not. Since I was not able to source a 10 pin mini din plug I decided to sacrifice one of a defective Mobile Station 1. By using a multimeter I mapped the pins to the correct wires. Since I can't see the actual pin schematic and numbers I closely studied the images and diagram at http://yaasan.mints.ne.jp/ready.html. I believe I have correctly mapped the pins and soldered to the correct pins on the 9pin D-SUB. After my first try I put all of the things together including the trackbox, arduiono etc. Fired up Desktop Station and opened COM6. Seems to work. Desktop station also identifies the trackbox. So far so good, right? Now this is where it gets strange. The first loco I tried was actually an mfx loco. I am aware of the possible issues with mfx but just thought I would try anyway. Guess what, it actually detected it right away! Took a few seconds but then "unidentified mfx loc" showed up. This is a loco I converted myself with the 60947 kit. However after detecting it I was not able to control the loco or it's functions. I tried playing around with the settings for a while but gave up. After this I tried with a delta locomotive. Set the adress to 24 using the dip switches. Added "24" in dekstop station. No reaction. I see in the console it sends loco speed and ping etc and also recieves some "random?" data. However I fail to control the locomotive. It does however move. Slowly forward. If I press stop. Then start. The loco is at standstill at first. Then slowly starts to move. It is like it takes my "accelerate" command very slowly. Everything stops/goes if i press STOP/GO in desktop station. So I seem to have some control. Flashing the Arduino was straight forward. I don't believe I could have done anything wrong there. Setting all the hardware up was straight forward except for the cable. The Desktop Station application does receive information. Registering the mfx loco confirms that. I do not seem to have any control though. I tried desoldering pin 2 at the D-SUB end. That resulted in errors and emergency stops in the console so this leads me to believe that if the cable would be incorrectly soldered, I would receive errors in the console? I have yet to try a regular FX loco. I am going to my parents after work to pick one up from my storage there. I do not see why delta locos would not work though. One idea is that they could be struggling with the "acceleration delay" when adding locos but I haven't had time to try this morning. Could that be the reason for the delta loco not working as it should? The speedometer did move accordingly when increasing the speed. B: Delta loco/issues with acceleration delay. If I manage to get a regular FX loco to work I know the problem with the Delta loco. If I don't it must be the cable. I guess I will have to strip the plug of the plastic and do it the "ugly" way to ensure the pin mapping is correct if that is the case. Unfortunately I am "stuck" at work for 8 more hours but I will be checking in here often as I would love to get this working . Any ideas as to what my problem may be? 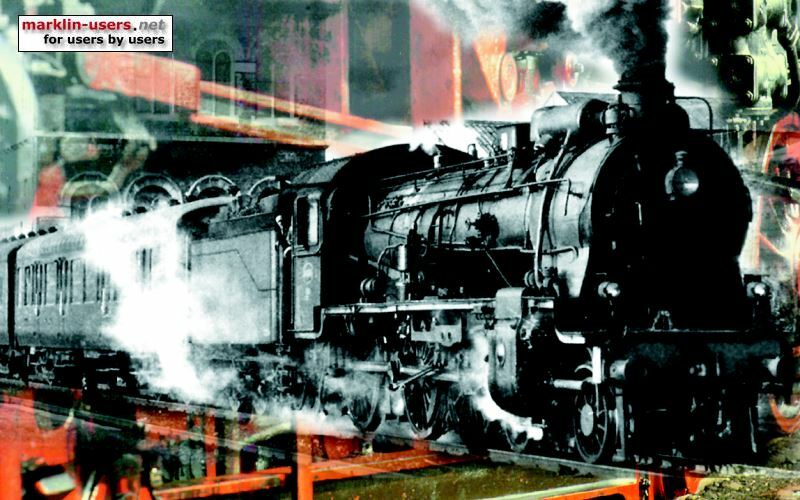 Your first practice is probably correct because the mfx loco is recognized. The configuration seems bad in this practice. Desoldring your cable seems to cause a bad result. CAN_H and CAN_L must be soldered. VCC and GND are recommended to solder. If you had already soldered CAN_H and CAN_L, don't mind to solder GND and VCC. Also please check short pins or pins of CAN_H and CAN_L soldered. Console has a debug message like "<-- xxxx" or "--> xxxx". Don't mind. Please type 23 or 22 or the others to register Desktop Station. If you have MS2, Please connect MS2 to 60113. Also connect Arduino too. You can see MS2's commands in the Console. Thank you for your reply! I have to quit work early today.. This is just too exiting! "Please type 23 or 22 or the others to register Desktop Station. " Do you mean that I should try other decoder adresses? Or are you referring to the delay of acceleration etc when adding locos manually? CAN_H and CAN_L as I understand is send/receive. Is one pin send and one receive, or do they both do the same thing in duplex? So just to be clear, I can try without soldering VCC and GND? Perhaps I should resolder the cable tonight just to try? I will try just soldering the CAN_H and CAN_L then. Probably a good idea to minimize my confusion. .
Also, have you tried Desktop Station with locos that are equipped with delta decoders? The reason I ask is that I suspect that perhaps the delta decoder's few speed steps could be an issue if adding the loco and not changing the acceleration delay setting. What do you think? I don't actually own a Mobile Station 2. I just bought the connector box for this project so I can't try with that. I do have a Mobile Station 1 though. Will that work? I presume it won't work with the MS2 connector box? Sorry for all the questions. I really appreciate your answers!